Paul O’Higgins SC, for Denis O’Brien, continued to cross-examine the former business editor of the Sunday Business Post Tom Lyons before the former editor of the newspaper Ian Kehoe started to give evidence. Mr O’Brien is claiming he was defamed by the newspaper on March 15, 2015, when My Lyons and other journalists reported over six pages on an unpublished PwC dossier into Ireland’s banks which had been given to the then Taoiseach Brian Cowen in November 2008. The newspaper reported that the PwC report revealed 22 men and their associated companies owed Irish banks €25.6billion when the property bubble collapsed. Mr O’Brien was number ten on the list of 22. One of Mr O’Brien’s complaints is that he was wrongly “lumped” in with a “gang” of “developer kings”. Mr O’Higgins also played an interview given by Mr Lyons to RTE’s This Week radio programme on March 15th 2015, the day the articles were published. Posted in Misc and tagged Denis O'Brien, Ian Kehoe, Sunday Business Post, Tom Lyons at 7:49 pm on February 15, 2019 by Bodger. 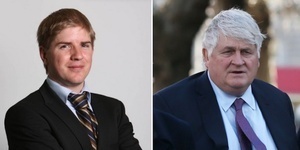 This afternoon, in the High Court, businessman Denis O’Brien finished giving evidence in his defamation case against the Sunday Business Post. Mr O’Brien is claiming he was defamed by the newspaper on March 15, 2015, when the then business editor Tom Lyons reported over six pages on an unpublished PwC dossier into Ireland’s banks which had been given to the then Taoiseach Brian Cowen in November 2008. He also disputes the figures which Mr Lyons attributed to Mr O’Brien and has said Mr Lyons should have rang him on the Friday before the article was published and asked him if he was “overstretched” or if he had “over borrowed”. 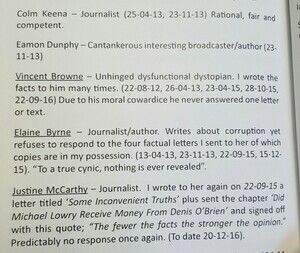 Mr O’Brien has claimed Mr Lyons never put these specific claims to him. The jury in the High Court last week heard about a separate article Mr Lyons co-wrote with Nick Webb in April 2012, while he was working at the Sunday Independent, which was about a different PwC report on Anglo Irish Bank, and which Mr O’Brien also said contained incorrect figures. Mr O’Brien, on Thursday, told the court that he believed he had taken no action over this 2012 Sunday Independent article which revealed his confidential bank details. On Friday, Mr O’Brien then told the jury that, contrary to what he had said the day before, his understanding was that his spokesman James Morrissey had actually engaged in lengthy correspondence with the Sunday Independent over the 2012 article and that he had, he believed, received an apology from INM’s then group managing editor Michael Denieffe. But this morning, the jury heard this apology had nothing to do with the article co-written by Mr Webb and Mr Lyons in 2012. Michael McDowell SC, for the Sunday Business Post, read out correspondence between Mr Lyons and Mr Morrissey ahead of the 2012 article in which Mr Lyons sought to get some information from Mr O’Brien to put into the article. Mr O’Brien agreed with Mr McDowell that the response from Mr Morrissey was essentially a “get lost” response. But Mr O’Brien said it was “polite”. Mr McDowell also read out correspondence between Mr Morrissey and Mr Webb after the article was published. Mr Morrissey had criticised Mr Lyons in his correspondence to Mr Webb and claimed Mr Lyons had acted unprofessionally. Mr McDowell said this amounted to an “attack” on Mr Lyons. He said it was “ridiculous” to pose questions about his banking in the first place as he was never going to give any answers. Mr McDowell put it to Mr O’Brien that this represented the “height of hypocrisy”. Mr McDowell said Mr O’Brien previously “went to some considerable length” in his evidence to say that the Sunday Business Post never contacted him about Mr Lyons’ story in 2015. Mr McDowell asked how he could “reconcile” telling Mr Lyons and Mr Webb to “get lost” in 2012 with his criticism of Mr Lyons in 2015, saying the journalist didn’t contact him for comment – when Mr O’Brien would never have commented anyway. Mr O’Brien said he was glad Mr McDowell mentioned the matter and again said Mr Lyons should have contacted him on the Friday evening before the Sunday Business Post article, and asked him specifically if he was “overstretched” and if he had “over borrowed”. Mr O’Brien said Mr McDowell was “mixing apples and oranges”. He said it was “none of his business” and that if Mr Lyons asked him about this “visa card”, the answer would be the same: “It’s private”. Going back to the 2012 Sunday Independent article, and the correspondence between Mr Morrissey and Mr Webb, in which Mr Morrissey accused Mr Lyons of being unprofessional and conducting himself in an unacceptable manner, Mr McDowell put it to Mr O’Brien that he was now “whinging” in the High Court claiming he had been defamed when he was “quite happy to defame somebody else in correspondence”. Mr McDowell put to Mr O’Brien that he was accusing Mr Lyons of unacceptable and unprofessional behaviour because he didn’t put a specific figure [about his banking] to Mr O’Brien – a figure he never intended on confirming, denying or correcting. Mr McDowell put it to Mr O’Brien that it was “utterly dishonest” of Mr Morrissey to defame Mr Lyons to his employers for failing to put an exact figure to Mr O’Brien when he knew Mr O’Brien wouldn’t comment. Mr O’Brien said Mr Lyons got the wrong number and he shouldn’t have published any figure if it was inaccurate. Mr McDowell put it to Mr O’Brien that he didn’t see the PwC report on Anglo Irish Bank which the Sunday Independent article was based upon. McDowell put it to Mr O’Brien that he then couldn’t have known if Mr Lyons quoted accurately from the PwC report or not. Mr O’Brien said: “No”. Mr O’Brien repeated again that to ask about his banking affairs is “grossly unfair” and an “invasion of privacy”. Mr O’Brien said whether the figure was right or wrong, he wouldn’t have commented on it. Asking Mr O’Brien how wrong the Sunday Independent figure was, Mr O’Brien wouldn’t say and asked Mr McDowell if he was now trying to invade his banking details. Mr O’Brien carried on refusing to tell Mr McDowell “how wrong” the figure in the Sunday Independent was. Mr McDowell further read out the response Mr Webb sent to Mr Morrissey in 2012 and into which he copied Declan Carlyle, who was an executive at INM at the time. The jury heard Mr Webb told Mr Morrissey that his claim Mr Lyons had acted unprofessionally was “completely unacceptable” and that it was being rejected out of hand. Mr Webb said it was “baseless” and “defamatory” of Mr Lyons. Mr Webb also said it was a “disgraceful slur” on Mr Lyons and he asked that Mr Morrissey “desist from disseminating this defamatory material forthwith”. The jury also heard Mr Webb told Mr Morrissey that Mr Lyons had acted as he should have and it was he [Mr Morrissey] who gave “perfunctory answers”. Mr Webb asked Mr Morrissey if he’d like to send figures, they could run a clarification. Mr O’Brien told Mr McDowell that he believed the latter comment was said “tongue in cheek”. Mr McDowell asked Mr O’Brien if he had seen Mr Webb’s correspondence, in which he accused Mr O’Brien, via Mr Morrissey, of defaming Mr Lyons. Mr O’Brien said he did. Mr McDowell then asked Mr O’Brien how he then could have given evidence that he had got an apology from Mr Denieffe over the 2012 Sunday Independent article. Mr O’Brien said the correspondence in relation to Mr Denieffe was related to an entirely different matter. He said he had apologised to the court, that he was trying to be helpful last week and that he may have confused matters further – for which he was sorry. Mr McDowell put it to Mr O’Brien that he must have known there was no apology over the 2012 article. Mr O’Brien said that, last week, he said he wasn’t sure about the apology and that he had said he would have to check – which he has since done and that is why Mr McDowell’s solicitor had been contacted about the matter overnight. Mr McDowell said that, far from INM giving an apology to him, they [INM] gave him “both barrels” over to the suggestion Mr Lyons had behaved wrongly. He also again repeated that Mr Lyons had no right to ring anybody up and ask them about their private banking matters. He said it wouldn’t happen in the UK and it shouldn’t have happened in Ireland. He said it was “extraordinary that this journalist would be that ballsy” to ask about his banking and then, Mr O’Brien claimed, get the numbers “wrong”. Mr McDowell put it to Mr O’Brien that he was refusing to divulge “how wrong” Mr Lyons was alleged to have been. He also said it was in the public interest to know about the insolvency of Anglo Irish Bank. Mr O’Brien said it was his private business and said “we’re verging on voyerism, trying to find out what my banking details are, it’s not fair”. Mr McDowell said the following to Mr O’Brien: “I’m going to put to you now that the fact that Anglo Irish Bank, at the time the PwC report was done, was hopefullsesy insolvent but pretending that it was solvent through the agency PWC report. Mr O’Brien said he was never a burden on any bank or IBRC, formerly Anglo Irish Bank. Mr McDowell said Mr Lyons believed, and still believes, that the Irish public deserved to know that a huge amount of indebtedness was concentrated on a small number of people. Mr O’Brien said they were going to disagree on this. At one point Mr Justice Bernard Barton intervened to say the jury needed to fully understand a point which was being made by Mr McDowell. Mr McDowell told Mr O’Brien he made a very serious complaint against Tom Lyons and his professional conduct in a letter, for failing to put a figure to Mr O’Brien – a figure which Mr O’Brien has since claimed was wrong, without now telling the court how wrong it is. And, Mr McDowell said, Mr O’Brien is now complaining that he wasn’t contacted in 2015, in relation to the Sunday Business Post article, even though he would have likely said ‘no comment’. Mr O’Brien said his first complaint is that Mr Lyons should never have published any number and, secondly, the figure that he did publish was “absolutely wrong”. Mr O’Brien went on to compare the Sunday Independent and Sunday Business Post articles and said it was totally different to be called a “buccaneer” [in Sunday Independent] as opposed to being referred to as a member of a “gang” [in Sunday Business Post]. “A pirate, originally one operating in the Caribbean. A person who acts in a recklessly adventurous and often unscrupulous way, especially in business”. Mr O’Brien said he was. He said ‘buccaneer’ is the name of a sporting club in Galway and “not a derogatory term in my mind”. He went on to say there was “no comparison” between the two articles and to compare them was like comparing “chalk and cheese”. Mr McDowell also listed Mr O’Brien’s property interests in Ireland, the UK, Portugal and Spain – following on from Mr O’Brien giving evidence that he is not a property developer but a property investor. At one point, Mr O’Brien quipped that Mr McDowell knew more about his property interests than he did. Mr McDowell said he was depending on information in the public domain and Google. Returning to the 2015 Sunday Business Post article, Mr McDowell put it to Mr O’Brien that, in 2008, PwC prepared a report for the Irish Government in which they indicated, among other things, first of all that the banks were claiming to be in rude health. Secondly, in the report, PwC put together a list of 22 – not 21, not 23 – of people who they said were the top borrowers from the Irish banks. He said the court is “naked here today” because Mr Lyons destroyed his copy of the report after publication of his article. Mr O’Brien claimed PwC would also never have used the words used by the newspaper to describe him. Mr O’Brien said the article was a “hatchet job” and became “more salacious” as it continued over a number of pages in the newspaper. Just before Mr O’Brien finished giving evidence, the judge again asked Mr O’Brien if it was his position that he basically told the Sunday Independent to get lost in 2012. Mr O’Brien agreed this was the case and said his banking affairs were none of Mr Lyons’s business. The judge asked Mr O’Brien if he would have taken the same approach if Mr Lyons contacted him in respect of the Sunday Business Post article. Mr O’Brien said it would have depended on the question. He said if he was told he would be described as a property developer and someone who had a detrimental effect on the country, that he was “overstretched”, he would have said that wasn’t true. Mr Lyons has started to give evidence this afternoon. Of his story based on the 2008 PwC report in the Sunday Business Post in 2015, Mr Lyons told the jury it was something which was “incredibly serious”, of “huge public interest” and that the newspaper took the matter “very, very seriously”. He also said the list was created by PwC and the sequence of people was put together by PwC. He said it showed the banks were lending too much to too few people. Asked if this was his judgement or PwC’s, Mr Lyons said it was PwC’s. In relation to Mr O’Brien’s view that his banking interests are his private affairs and not of public interest, Mr Lyons recalled that Mr O’Brien mentioned his credit card details but went on to say this is not what the Sunday Business Post was reporting on in 2015. Mr Lyons said he “couldn’t care less if Mr O’Brien pays for Netflix or Sky”. He said the PwC report was about “big picture numbers” and that the report was paid for by taxpayers which the Government “used to say we’re not in trouble, let’s go with the banking guarantee, everything’s fine”. He said the context of the report was the biggest financial crisis in the world, not just the biggest financial crisis in Ireland. Mr Lyons said he accepted Mr O’Brien’s view but, in his opinion, the PwC report was an “important document prepared by the State into what happened in the banks and public interest trumps one man’s opinion”. Mr Lyons also said that he and his editor Ian Kehoe did have a conversation about whether or not they should have included Mr O’Brien’s name in the list. He said the debate over whether to publish Mr O’Brien’s name or not came about because “it’s fair to say, he sues a lot of journalists”. Mr Lyons said there was a “fear factor there around him”. But, he said himself and Mr Kehoe decided: “no, we’ve got to be brave here, we’ve got to include him”. He said they couldn’t leave Mr O’Brien out and treat him as a special case over any possible fears that to include him would harm their future careers. To further contextualise his point, Mr Lyons looked directly at Mr O’Brien when he said, by way of an example, this could have been a real fear if he were to ever potentially go back to work in either Newstalk or Today FM – radio stations which are both owned by Mr O’Brien. Mr Lyons said the newspaper “reported faithfully” what was in the PwC report. The court has heard that the banking inquiry, which was taking place at the time of the publication of the Sunday Businss Post article in 2015, requested of Mr Lyons a copy of the PwC report. But, at this point, Mr Lyons had already destroyed it, to protect his source. Posted in Misc and tagged Denis O'Brien, High Court, Sunday Business Post, Tom Lyons at 3:33 pm on February 12, 2019 by Bodger. You may recall the Siteserv sale back in 2012. 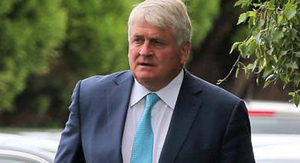 Denis O’Brien owed Anglo Irish Bank hundreds of millions. 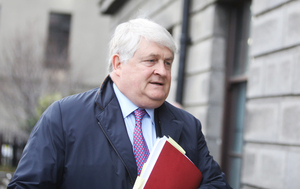 Siteserv owed Anglo Irish Bank €144 million. 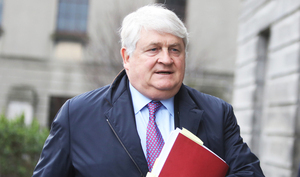 Denis bought Siteserv debt-free for €45 million. You will find a detailed background to the deal here. Since then a Commission of Investigation, led by High Court judge Brian Cregan, has been tasked with investigating the sale of Siteserv to Denis O’Brien, and other matters. Earlier this year Catherine Murphy, of the Soc Dems, submitted a 300-page statement to the Commission detailing her research into the sale. The commission has since written to Ms Murphy saying, if she doesn’t reveal her sources, “it may not be possible to advance some of the issues raised” by her. Tom Lyons reported that an anonymous email sent to Taoiseach Enda Kenny and others – including the then Financial Regulator Matthew Elderfield, Fianna Fáil leader Micheal Martin and Maurice Keane, a non-executive director of IBRC – is to be investigated by the commission. A special email set up by an unknown party used an address called whistlebx@live.ie on April 5, 2012 at 12.20pm to make various allegations about the controversial sale of the business by IBRC to O’Brien a few weeks earlier. The contents of the “DOB” email were previously posted online in the comments section of the website Broadsheet.ie but its contents received little attention at the time. The comment was left under a Broadsheet post about the Siteserv sale on April 5, 2012, a few minutes after the email was sent to Mr Kenny. Regular entertaining of Anglo senior management by Denis O’Brien has always been a feature, but that has increased significantly since Mike Aynsley, Tom Hunnersen and DOB’s personal friend Richard Woodhouse have joined the Bank. A few weeks ago DOB and his wife were seen on the town with Mike Anysley, Tom Hunnersen and their wives. Denis while he is in Ireland is driven around by Mike Coughlan (a former Anglo employee) and is a regular visitor to the Anglo offices in Burlington Road, and is down there this morning having a one to one with Mike. Most worrying is that the management of DOB has been moved under Richard Woodhouse, a close personal friend of Denis. Then the Siteserv account is also moved over to Richard Woodhouse’s management. Interesting DOB’s initial bid for Siteserve was too low to be included in the 2nd round of bidders and he was initially not included in the 2nd round. DOB was not the highest final bidder, but IBRC asked for a letter to be produced that showed that DOB’s lower bid was the best bid. Another account that has been moved to Richard is the personal borrowings of Brian Harvey and DOB has promised (in support for supporting the DOB bid) is that he will arrange for Anglo to do a deal on Harvey’s debt. The independent consultant to Siteserv is a long friend of DOB (worked on Boundary – see below) and is a also a heavily indebted borrower of Anglo who DOB has also promised to sort out. Then the management of the Niall McFadden/Boundary Capital relationship is also moved to Richard Woodhouse. Anglo now looking to sell the debt of Niall McFadden (a close friend of Denis O’Brien) to DOB for a fraction of the original amount to allow Niall McFadden fraustrate National Irish Bank’s bid to secure bankruptcy. More worryingly, IBRC (when the case was being managed by the Personal Lending team) initially decides that forebearance is the best option in the management of the Tony O’Reilly relationship (a bitter foe of DOB). Then suprisingly, the case management is moved to Richard Woodhouse, and the new team decides to take a more agressive stance on O’Reilly with the case expected to go legal shortly. An internal review, however, was carried out at the time by IBRC into the allegations made in the email in a project code-named Rain. A position paper was prepared to help the bank respond to questions relating to it. This was circulated both inside and outside the bank in response to queries about the email, which was in circulation between senior politicians, civil servants and journalists. IBRC concluded that allegations in the email were either false or a misinterpretation of events. James Shaw, group operations in IBRC, carried out a review of the bank’s computer systems which failed to find who sent the email. Kroll, the corporate investigations firm best known for tracking the fortunes of Saddam Hussein and the late Haitian dictator Jean-Claude Duvalier, was then appointed by the bank to investigate. 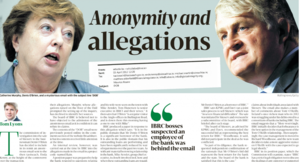 The bank suspected an employee of the bank was behind the email, as parts of it described the movements of O’Brien and IBRC chief executive Mike Aynsley. Kroll however was unable to determine where the email originated from. The O’Brien dinner referred to in the email was not attended by Hunersen – but was attended by Aynsley and Richard Woodhouse (an IBRC executive). Former minister for justice Michael McDowell later mentioned this dinner in a speech in the Seanad in July 2016. “The anonymous blog that Mr McDowell referred to is just plain wrong on just about everything it raises, except for the fact that there was a dinner,” Aynsley said. The purpose of the dinner was to mark Aynsley defeating O’Brien in a charity weight-loss competition. Alan Dukes, the chairman of IBRC, he said was aware of the matter and had no objection. Posted in Misc and tagged comment, Cregan, Denis O'Brien, email, IBRC, Siteserv, Tom Lyons at 12:21 pm on August 28, 2017 by Broadsheet. From The Irish Times letters page on March 25, 2011 – three days after the publication of the Moriarty Tribunal. The media frenzy and what it is generating reminds me of the movie Twelve Angry Men and the book To Kill a Mockingbird. The political and media piranhas have smelled their victims’ blood and in the low moral ground where they play out their pretensions, the actors in this dreary drama are set to play their pretentious parts! At stake is one of life’s most important psychological and emotional conditions: reputations. In Twelve Angry Men, the so-called “evidence” was hearsay, innuendo and prejudicial malicious gossip. 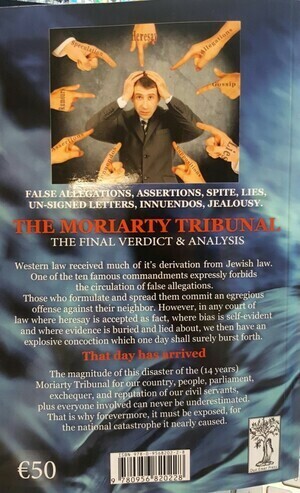 It took one man’s love of justice to convince his biased peers of the accuseds’ innocence. After the tribunal’s 14 years of forensic foraging and a bill of approximately €250,000,000, Denis O’Brien has admirably stated his constitutional right under Article 40 to a good name. We shall soon all witness how much as a nation we love justice or gossip! Having lived here most of my life I won’t hold my breath. 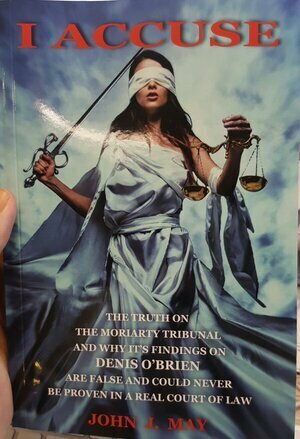 Posted in Misc and tagged Denis O'Brien, I Accuse, John J May, Moriarty Tribunal, Tom Lyons at 12:20 pm on March 2, 2017 by Broadsheet. 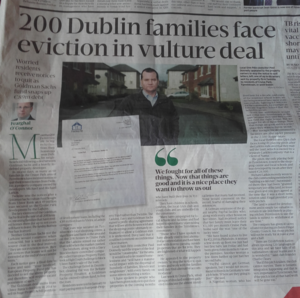 Journalist Fearghal O’Connor, in yesterday’s Sunday Business Post, reported how more than 200 families renting homes in Tyrrelstown, Dublin 15 are facing eviction. Twinlite – a property company owned by developers Michael and Richard Larkin – sent letters informing the families that they have to leave the properties, after a Goldman Sachs vulture fund bought an €89million loan secured on the homes by the Larkins, from Ulster Bank. The €89million loan was secured on Tyrrelstown’s local shopping centre, ‘a significant’ land bank in the area, and the 208 houses in Cruise Park which the Larkins rented out. 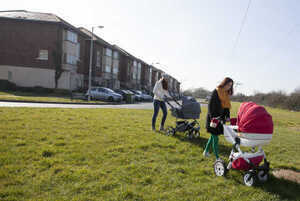 Some families have been renting the homes for up to 10 years. Further to this, business editor of the Sunday Business Post Tom Lyons spoke to Keelin Shanley on RTÉ One’s Today with Sean O’Rourke Show earlier, about the wider implications of this move. Also in yesterday’s Sunday Business Post, Mr Lyons reported that Nama sold Dublin’s Clarence Hotel to a consortium including Bono and the Edge without inviting any other bidders to tender for the hotel. “The hotel is understood to have been sold for less than the total debts of the company which previously owned it. Last year, another State agency, the Dublin Docklands Development Authority, sold U2’s former recording studio for €450,000 to the band without a public tender. 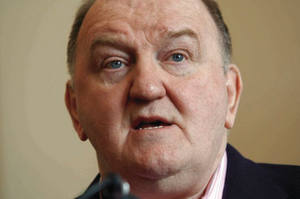 Richard Larkin has spoken to Joe Duffy on Liveline this afternoon and is disputing the story in the Sunday Business Post. “As a developer we don’t have any debt at all. This rental property is held in a property fund, called EPS, that we manage the assets for. Now that company has a loan that they owe to Goldman Sachs but Goldman Sachs don’t know anything about this. I mean the first thing Goldman Sachs heard about this was on Sunday when the read the Sunday Business Post. “… There’s no evictions, first of all, their lease won’t be renewed, some people have six months left on their lease, some people have four months left on their lease, you know. Posted in Misc and tagged Tom Lyons, Vulture funds at 11:47 am on March 14, 2016 by Broadsheet.